Lyssa, the boys, and I pulled in around 2:30 pm with a truck bed full of tools and burnables. Beautiful day; sunny and upper 70s. 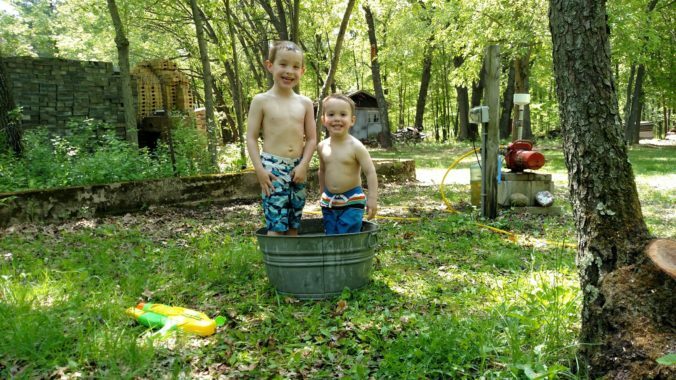 I backed the truck up to the pole barn to offload my tools and the boys were off on their Power Wheels. Lyssa made herself comfy with a book while I stacked cardboard and the remains of our old coffee table in the burn pit. There’s a lot to do up here, as always, but I don’t really have a set agenda. The only real goal of this weekend is to have our first overnight stay as a family. As I was looking around and sizing things up, inspiration struck. The tree at the base of the driveway would have to go. A little bigger than I had expected. Good thing there was nothing in its way. Over half of the upper branches were dead and bare, so I figured if the tree was going down, it’d be better if it was on my terms. 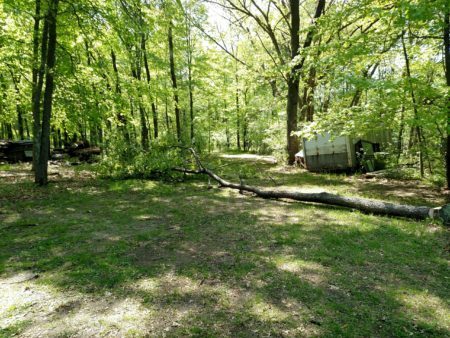 I fired up the chainsaw, made sure the kiddos were well clear, and the tree was on the ground in short order. Jake was really interested in how I cut it, and went to show off the “felling wedge” to Lyssa and Josh. He thought it was really cool that I could get the tree to fall just the way I wanted it to. Hell, so did I. I’m still kinda new at this. As long as the chainsaw was out, I also trimmed some dead limbs from the small tree next to the pump. I had a helluva time carving everything up, though. I must have really dulled the chain when I was clearing brush and stumps last trip. The boys gave me a hand hauling limbs and branches over to the pit. Poor Josh was getting frustrated; he couldn’t understand why he wasn’t able to lift the big pieces like his daddy. He’ll get there soon enough. Easily one of the hottest fires I’ve had up here, rivaling the scorcher last fall. 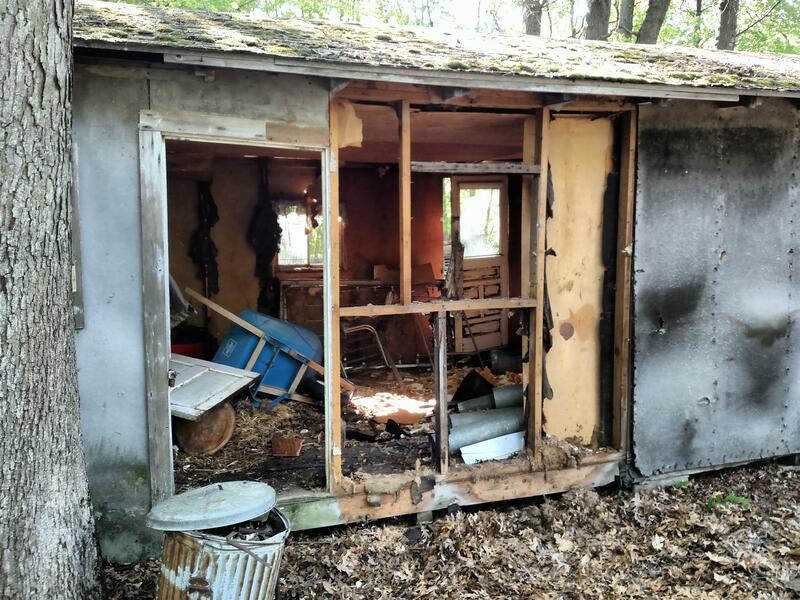 By the time Lyssa and Jake were back from their supply run, I had started prying some of the wallcovering off of the woodshed. I wanted to see what I was getting into by demolishing the place and how much I’d be able to burn vs haul away to the dump. 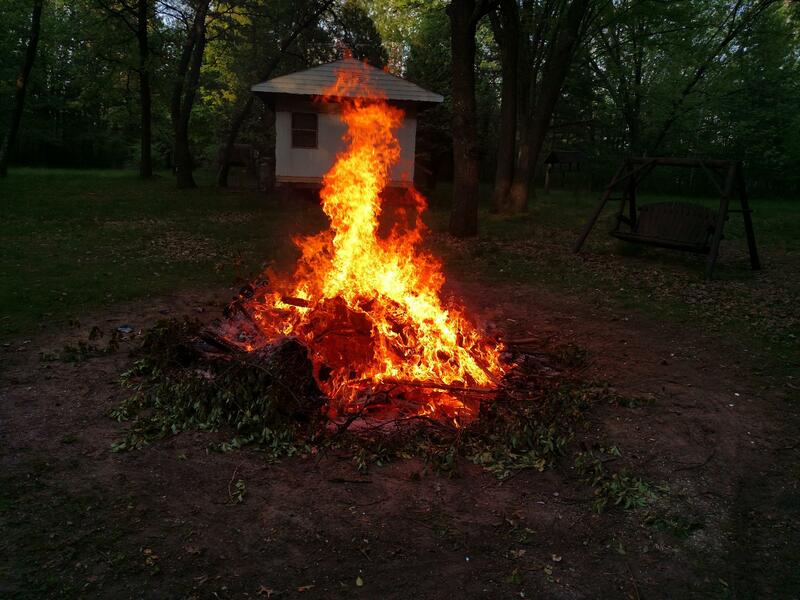 Fortunately, like many things up here, it’ll burn quite nicely. The outside panels are made of compressed fiberboard, the inside panels are just plywood, and the fiberglass insulation that was once between them has been long cleared out by various critters using it for nesting material. Things are going to get uglier before they get prettier. I added a few wall panels, the door, and window frames to the fire, then helped Lyssa haul the groceries into the keep. She had been thawing out the brat burgers I bought earlier this year and had some fresh green beans rinsed out and ready to boil, so I grabbed the grill out of the pole barn and hauled it over. We had a nice dinner on the deck and were all feeling full and tired. I put away the grill, closed up the pole barn, and started heating a tank of water to take a shower. Sure is nice to be able to fill that from a running faucet and not have to go outside and fire up a pump first. Lyssa had gotten the boys cleaned up and in their jammies while I was taking care of things outside. They snuggled and watched a movie while I showered the sweat and sawdust off of me. I had to make do with liquid hand soap as I forgot to pack bar soap and shampoo in my overnight bag. I’ll have to at least bring a few bars of Dial next time I come up. Feeling refreshed, I joined everyone in the living room for a bit. The boys were fighting sleep, so we let them watch some more TV while I tackled another project. I hung six sets of venetian blinds that used to be on our porch in Oshkosh, one on the window by the kitchen table and the other ones on the living room windows. We’ve got our privacy and sunblock back. It also looks a whole lot better than the old roll-up blinds that were in here before. Jake fell asleep on the futon while I was finishing up. I kissed Lyssa and Josh goodnight in the bedroom and joined Jake on the couch. I’m already really glad for the blinds as the full moon is extremely bright tonight. I read for a bit and was asleep by 10:30. I think Jake needs to sleep in restraints. I woke up every few hours to a pair of small, angry, kicking feet in my back and a complete lack of blankets. At least Lyssa and Josh fared better in the back. Next time, we’ll have to see how the boys do if we put them both to bed on the futon. For better or worse, we were all up and dressed by 8:00 and ready for some breakfast. Off to Aunt Judy’s! I can’t believe how much food our boys ate. Jake put down a plate-sized belgian waffle topped with blueberries and whipped cream, three sausage links, and a tall glass of chocolate milk. Josh matched him with a plateful of scrambled eggs, two pieces of toast, two sausage links, and an apple juice. Guess they worked up quite an appetite running around yesterday. Before heading back, I went to check out J&A Archery and Feed. I’ve been looking for a place in town to buy bird feed and they’re just on the other side of the street from Dollar General. It’s a nice place, and the prices are pretty much the same as Menards. We left with 100 lbs of black oil sunflower seed. Now that I know the feeders are safe from squirrels, raccoons, deer, and the like, I can keep them full all summer long. Once we were back, I started work on what could only really be called a contraption. 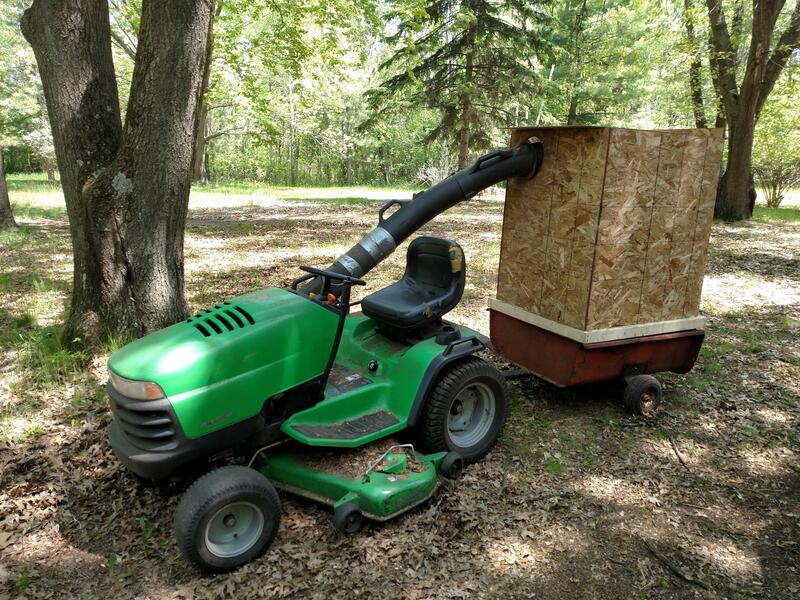 I fished out an old lawn tractor trailer from behind the woodshed, built a crude frame around it with 2x3s and OSB, and connected it to the riding mower’s leaf collector by way of three different rigid plastic chutes. It’s a weird looking thing for sure, but you can’t argue with results: I fired up the mower, ran through some fairly leaf-ridden areas of the yard, and left nothing but fresh-cut grass in my wake. The goofy thing actually works. I’ve got to work on sealing it up a little better and making it a bit easier to empty, but at least we’ve got a high-volume leaf collection system now. While I was still assembling the frankentrailer, Lyssa and the boys were taking a ride on the blue ATV. So I was a little confused when they all came walking out of the marsh without it. Lyssa wanted to brave the long trails and got it stuck in the mud a few feet out from my dad’s deer stand. I figured, no big deal, I’ll just teach her how to switch it into four-wheel drive, until she informs me that she can’t get it to start, either. I go and check it out, and sure enough, dead key. The gauges come on, the lights and winch work, but nothing from the starter, not even a click. I went back to the pole barn, grabbed the green ATV, and proceeded to tow the disabled blue one back into the yard. Of course, it wasn’t until that was all done that it finally occurred to me to try the pull start, which worked like a charm. So while there’s something messed up with the starter or wiring, at least it still runs just fine. I’ll have to haul it home one of these days; I’m better equipped to handle electrical issues in the garage in Oshkosh. Lyssa cleaned up the keep, vacuuming, doing dishes, gathering the dirty laundry and linens, and hauling out the garbage, while I closed up shop out in the pole barn and packed up my tools. It’s great to have an extra set of helping hands up here, and even better that we can all come up together for a weekend now. I’m looking forward to some more relaxing trips once the spring cleaning rush has died down. We closed up the keep and were on the road by 2:30 pm.